When natural rubber (NR) latex is epoxydized, it is converted to a new plastic (Epoxydized Natural Rubber or ENR) with many favorable properties. Damping and anti-vibration characteristics are improved. ENR is oil resistant and has a better air impermeability i.e. better sealing properties. ENR or Epoxyprene is a speciality polymer produced from natural rubber latex, cis–1,4–polyisoprene, with epoxide groups randomly dispersed along the polymer backbone. Two grades are available commercially, Epoxyprene 25 and Epoxyprene 50, indicating 25% and 50% epoxidation respectively. In collaboration with Kruthwong & Sprenger Co.Ltd, our main distributor for Southeast Asia, we measured the ENR concentration using the Spinsolve60 benchtop NMR spectrometer. Typical 60 MHz benchtop NMR spectra of ENR samples are shown in Figure 1. The peak at 2.7 ppm is from epoxy (E), the peak at 5 ppm is natural rubber (NR). The ENR ratio can be calculated by E/(E+NR). However, the epoxy peak at 2.7 ppm suffers from significant overlap by the tails of the CH2 resonances at 2.0 ppm. This makes the ENR measurement using standard 1D spectra inaccurate. Figure 1: Spinsolve60 Proton NMR spectra of natural rubber samples with different ENR. In order to obtain a clean baseline for peak integration in the region of 2.5-3.0 ppm, a T1-filter was implemented to suppress the CH2 resonances at 2.0 ppm. With this implementation, the epoxy and rubber signals can be nicely separated and integrated accurately to determine the amount of epoxy present, as shown in Figure 2. 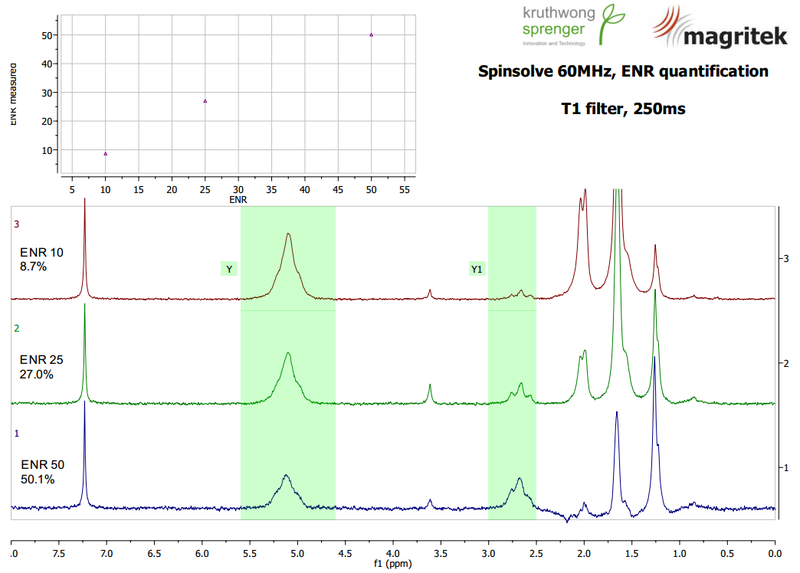 Figure 2: Spinsolve60 Proton T1-filtered NMR spectra of natural rubber samples with different ENR. Today ENR-25 and ENR-50 are used in many applications and new product developments are on the way in the apparel industry (foot wear), automotive industry (tires) and many others. This kind of benchtop NMR based quantification of epoxy will allow manufacturers to optimize their production processes efficiently. Buyers of ENR have a handy tool to control their purchase and guarantee fair trade.